Not much is known about Apple’s next iPhone. The much-anticipated iPhone 7 has been the subject of many rumors attempting to guess everything from the price to the release date. While hard details are hard to come by, at least one concrete fact emerged last week. Apple (AAPL) has found a new supplier for the phone’s modem chips. 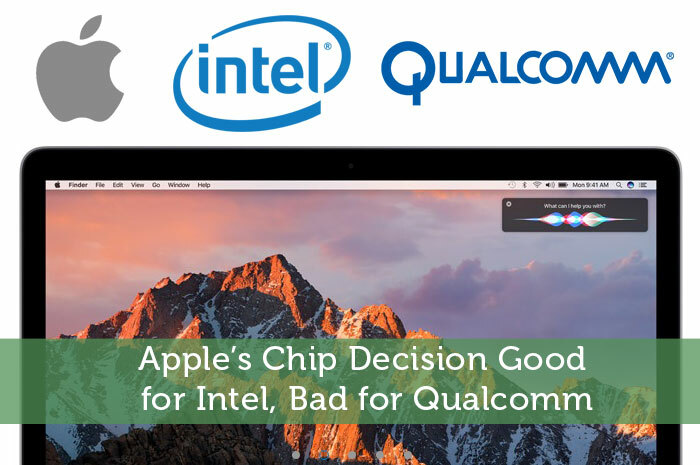 Instead of exclusively going with Qualcomm (QCOM), Apple is now working with Intel (INTC) for some versions of the upcoming iPhone 7. According to Bloomberg, Intel’s modem chips will be used on iPhones for AT&T’s network, while Qualcomm remains the supplier for Verizon network phones and for China. It’s a small but important step for Intel to finally make some headway into the lucrative mobile industry. AT&T is the U.S.’s second largest cell provider by market share, so Apple’s decision to expand its supplier base is a significant breakthrough for the mobile-challenged Intel. Intel is the world’s largest chip manufacturer, yet the rise of mobile technology in the past decade caught the blue-chip company completely off guard. A month ago, Intel conceded that they’re restructuring their approach to the mobile industry in light of a massive 12,000-person layoff. Admitting defeat, Intel canceled its upcoming new smartphone and tablet. This concession was probably a wise move, as the company’s mobile division lost $3.1 billion in 2013 and $4.2 billion in 2014. Despite those heavy losses and a slowing market for PC that threatens Intel’s core business, shares are only down seven percent on the year. Intel’s steadiness and generous 3.25% dividend yield has long been appealing to investors. If Intel can finally start racking up some wins on the mobile market, then shares might experience some growth after a couple years of flatness. While the news that Qualcomm will be losing business for several million iPhones a quarter isn’t great for the chip manufacturer, it also isn’t a surprise. Qualcomm Chief Executive Officer Steve Mollenkopf warned analysts in April that he expected Apple would be switching to another chipmaker. The market responded by lowering Qualcomm two percent, but in some ways, the CEO may have overstated the potential loss in business. Qualcomm remains the biggest manufacturer of the iPhone’s modem chips and still holds partnerships with some of the biggest Android phone manufacturers. Share prices are up 7.5 percent on the year. However, Qualcomm’s problems in the mobile industry have been going on for a couple years now, and shares remain down 33 percent from the all-time highs of 2014. Last year was especially rough for the company that relies on the whims of the mobile industry. They lost a lucrative partnership with Samsung, and the mobile industry began to slow compared to the incredible growth of years past. To top it off, making headway with the increasingly popular Chinese manufacturers proved to be a challenge. All those headaches are part of the reason why Qualcomm is trying to diversify outside the hyper-competitive mobile industry. The auto industry and the rise of smart cars represents a promising field, as Audi announced that the 2017 lineup of vehicles will feature Qualcomm processors. The company is also shaking up its licensing agreements for patents to hopefully bring in $10 billion in revenues by 2020. While Intel is looking to break into the mobile industry in a significant way, Qualcomm is doing the opposite and hoping to break out. Both companies are making solid efforts in diversifying their businesses, yet the results remain to be seen for investors. Like the iPhone 7, it’s too soon to tell what will become reality.